Occupy Central deliberately ignores overwhelming public demands to end protests, resorts to clashes with police, violence. Fully qualifying claims that the so-called “Occupy Central” or “Occupy Hong Kong” movement is little more than US-backed political subversion dressed as “pro-democracy,” mobs remained in the streets, creating chaos as police worked to reopen streets and return order to downtown Hong Kong. 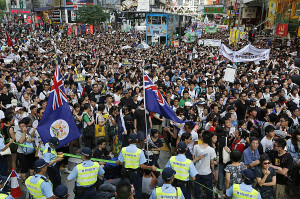 A recent poll carried out by one of the movement’s own collaborators – the Public Opinion Programme (HKU POP) of the University of Hong Kong – revealed over 80% wanted the protests brought to an end with over 60% advocating police action to clear the streets if necessary. In direct defiance not of the government in Beijing, but the will of Hong Kong’s people themselves the “Occupy” movement claims to represent, protesters have vowed to continue disrupting order and remain in the streets as long as possible. The Western media and Western corporate-funded foundations remain the movement’s only significant advocates. The Epoch Times would report that protesters began breaking down into smaller groups to evade police, throwing objects at officers and clashing with them, then darting in and out of businesses and roads to escape arrest. Occupy Central’s troubles began almost with the protests themselves as the questionable nature of the movement’s leadership and its funding was fully exposed as emanating from the US State Department and channeled to various organizations involved in the movement by notoriously corrupt media tycoon Jimmy Lai. The opacity of the movement’s funding and its leadership’s connections with the US State Department revealed what was supposed to be a “pro-democracy” movement as nothing more than a bid to extort from Beijing through the use of street mobs the parting demands made to the Chinese government regarding the administration of Hong Kong by the British Empire. Aspirations for “democracy,” or the ability for Hong Kong to nominate and vote for its own politicians is in all actuality a bid for what remains of pro-Wall Street and London political movements in Hong Kong to carve out a foothold in the region and use Hong Kong as a springboard to create greater division across Chinese society. In other words, to create a neo-imperial colony for the West to use once again to influence mainland China. However, the degree to which the “Occupy Central” has been exposed as a foreign-backed political destabilization is so complete that there is little likelihood that such a destabilization will be possible in Hong Kong, or anywhere else inside of China well into the foreseeable future. Leaders including Benny Tai and Joshua Wong have all been linked to US State Department funded organizations, projects, and campaigns. “Occupy Central” leaders including Martin Lee and Anson Chan literally were in Washington D.C. earlier this year lobbying for US support in front of the very organizations funding the political activity of virtually every prominent “Occupy Central” leader. Even HKU POP has been implicated in “dirty money” used to qualify an ad hoc referendum carried out by “Occupy Central” ahead of the recent protests. The decision to remain in the streets and create as much chaos as possible despite the desires of the local population for the protests to end clearly illustrates the true, self-serving nature of the protests and their purpose of creating chaos, not facilitating progress for Hong Kong or greater China. Resorting to clashes and violence perpetrated against police is designed to trigger injuries or fatalities designed to justify further disorder and chaos. Hong Kong, like many other cities and nations targeted by Wall Street and London for destabilization is being led down a dangerous path toward costly division and conflict. The residents, police, and government of Hong Kong must exercise extreme caution and patience to deny the US-backed movement any opportunity to capitalize on the chaos it is now attempting to create.